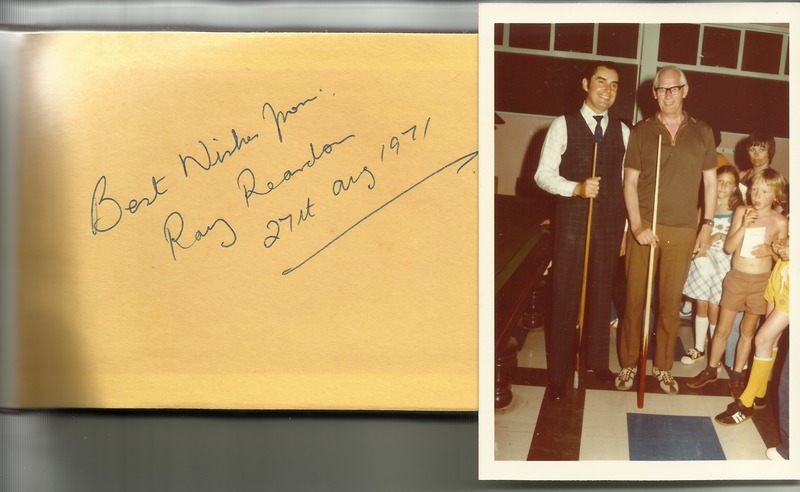 Ray Reardon is a big name in snooker, and was at his prime in the 1970’s. He won six World Championships during these years, in 1970, 1973, 1974, 1975, 1976 and 1978. He lost out in the semi-final in 1971 and reached the quarter-finals in 1969, 1972,1977, 1979 and 1980. This put him in huge demand for the holiday camp market, which is where I saw him at Pontin’s in 1971. We went to a different Pontin’s Holiday Camp each summer, and they all tend to merge into one, but I think this was Wall Park, in Brixham, Devon. He would make a personal appearance, performing some show shots, signing autographs and posing for photographs. I think it’s fair to say my Dad was more excited about this than I was. In the photo I love the way he is almost pushing the children out of the way to get his photo taken with Ray Reardon! I don’t remember any other adults wanting photo’s taken at the time. He also grabbed my autograph book for me and got it signed and dated, which is something I would never have done because I was always far too shy. To be fair I do remember using my own children in this way at various events, particularly Brighton & Hove Albion’s annual ‘meet the player’ gatherings for the Junior Seagulls! This entry was posted in Gordon Charles Dinnis, SPORT, Table tennis and tagged Pontins, Table Tennis. Bookmark the permalink.